On a very unusual start to a particularly cold few days of extreme winter weather I found myself, almost against my better judgment, boarding a plane from sunny Ft. Lauderdale to fly to the port of Bayonne, New York to board Royal Caribbean’s newest ship – the Quantum of the Seas, indeed had it not been for the fact that the ship had been getting so much hype I felt I just had to see her, I probably would not have boarded that plane as the weather forecast for the period of my cruise was dreadful. 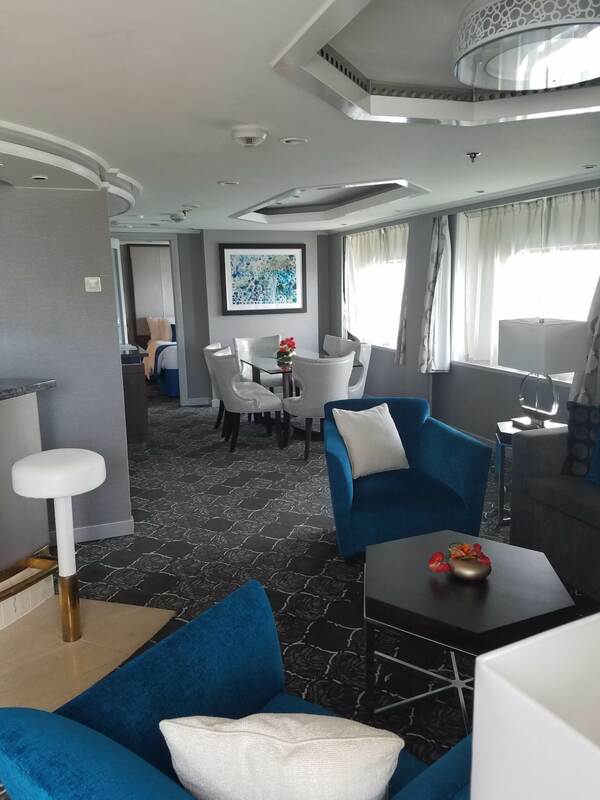 sailing date and deal with the pre-boarding requirements and at the same time make such restaurant, show and spa appointments as one may wish to engage in. Embarkation and indeed disembarkation was a breeze, by far the easiest have ever encountered. Arriving at the pier one cannot but be impressed by the sheer size of the Quantum its is immense and looking at her from the pier at close to sea level she simply towers over you, disappearing into the murky early morning mist in the distance in both directions. No question, you are going to be doing a LOT of walking on-board this baby. 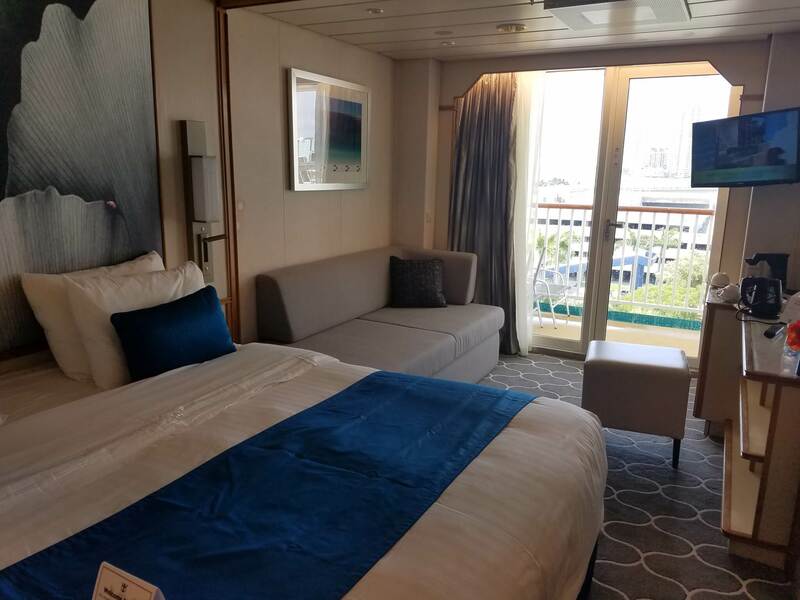 Once on-board you can immediately go to your stateroom where your electronic key is waiting for you. This credit card style key and the two wrist watch style keys are your passage to everything on the ship, whether you are ordering a drink or doing some activity you’re tracked and scanned the whole time. 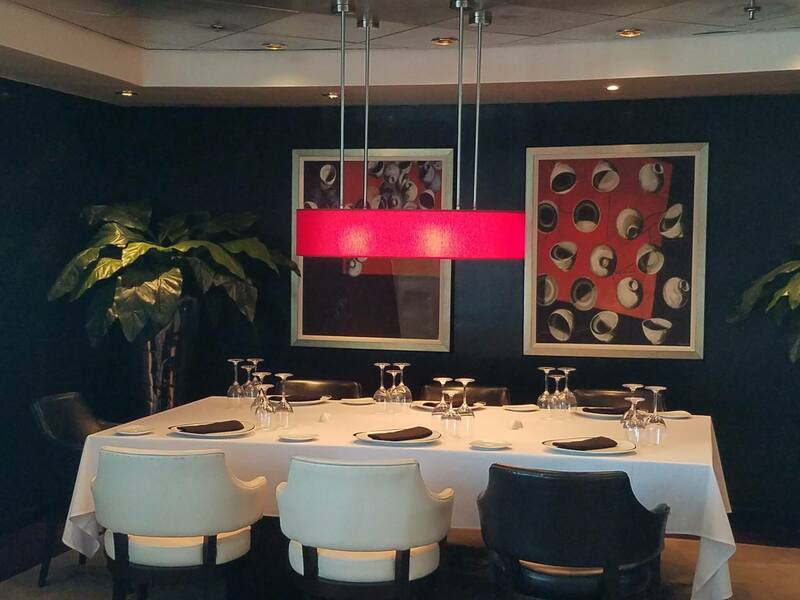 on board are that of a pleasant and tastefully done interior. I personally found the dark wood paneling used throughout to be a little bland especially at night when the lighting dims as in my opinion it almost becomes a bit dismal. But there are lots of interesting public areas with the central park style being used as a bazaar during the day and alfresco entertaining in the early evening. 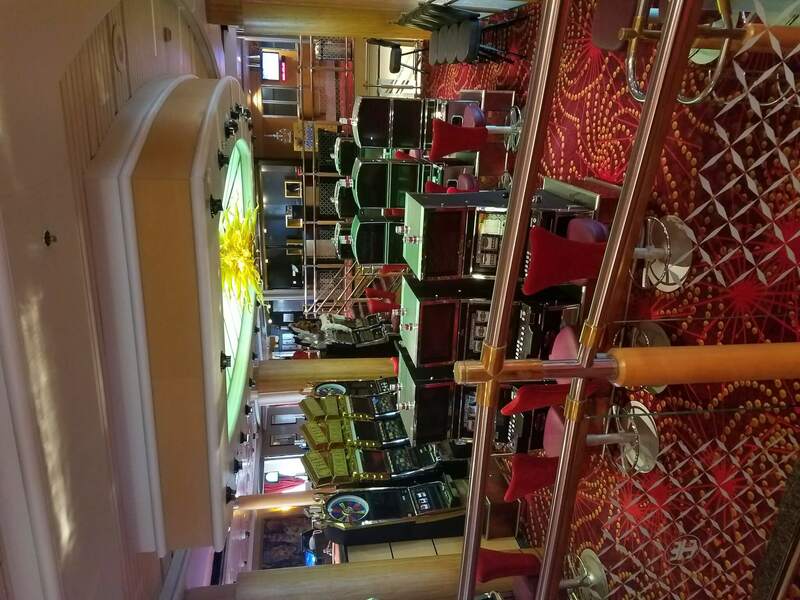 It’s here you will find the boutiques, bars, coffee shop and the pub all of which are seemingly popular with the onboard guests. But it is in the realms of dining and technology that this ship excels. The Quantum is RCI’s first “Smart Ship,” giving cruisers the online tools they expect in their daily lives. For example, the company has made a huge investment in satellite Internet, promising speeds that rival those you get on land; that’s a huge deal, as cruise ship Internet is generally quite slow. Indeed, surfing speeds on the Quantum are fast, fast enough that you can stream video and chat to your family at home on Skype. However, the really big deal which is debuting on the Quantum is Royal iQ, an interactive scheduling service that lets passengers make reservations for dining, entertainment and activities (like skydiving or the North Star) and keep track of their schedules with a calendar feature. It’s available as an app for your mobile device or via kiosks and tablets throughout the ship. 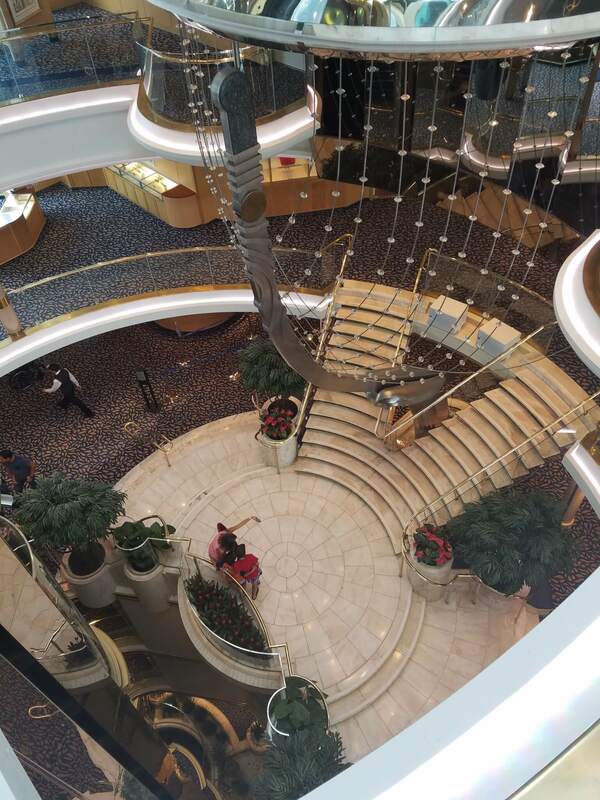 (Kiosks are located by elevators throughout the ship; tablets are in the guest services area.) 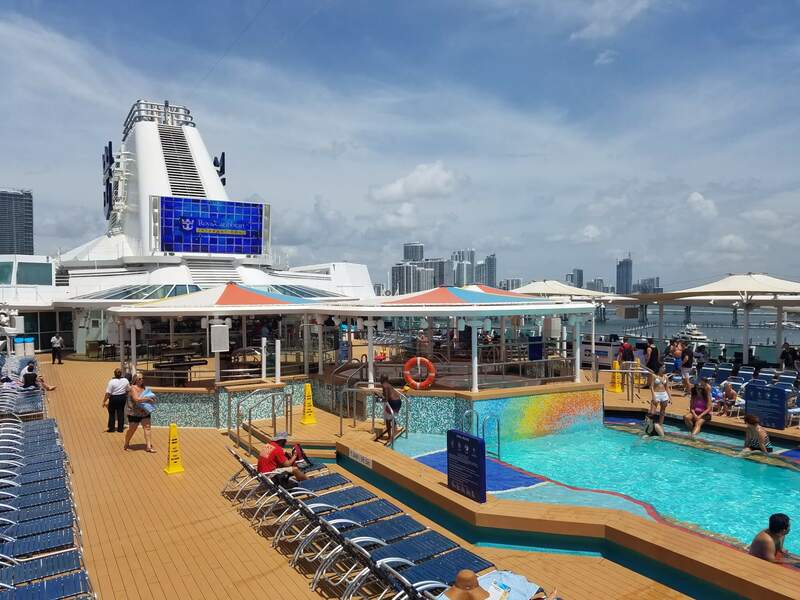 The app can only be used on the ship, though you can download it ahead of your trip, equally useful was the interactive photo kiosks, USB ports for in-cabin charging and RFID bands instead of key cards. 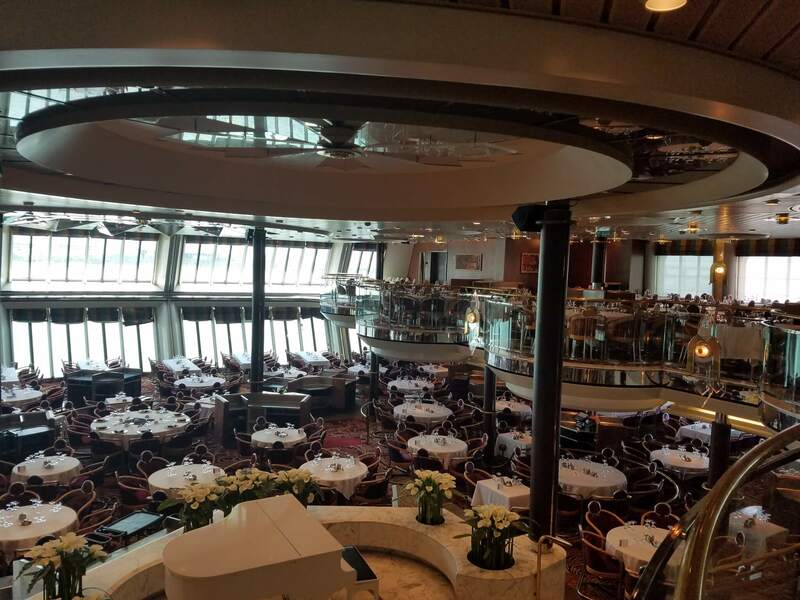 Perhaps the most noticeable change from the traditional cruise ship are the dining venues RCI has eliminated the large-scale main dining room concept and replaced it with several small venues that offer the same menu options each night. 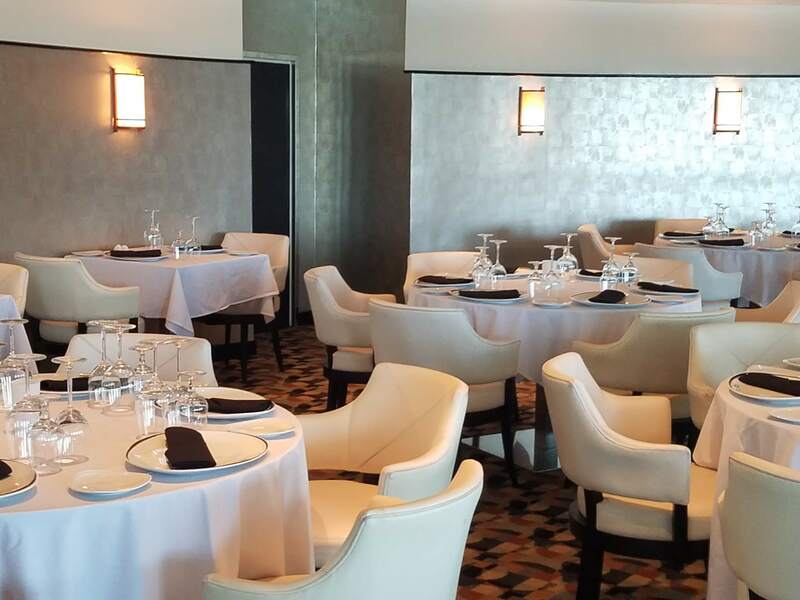 Calling its concept “Dynamic Dining,” RCI is banking on passengers embracing the idea of exploring new culinary experiences and not minding a bit of planning to do so as to really get the most out of Dynamic Dining one needs to plan well in advance by making reservations ahead of the cruises, rather than hoping to book a table once on the ship. There are plenty of options, twenty two in fact, ranging from the sophisticated up-charge, to the modest burger joint, something for everyone with just as many ethnic choices it would appear, Classic America, French, Italian, Japanese, Steak House, pub grub, grills, pizza as well as coffee shop and ice cream parlor. 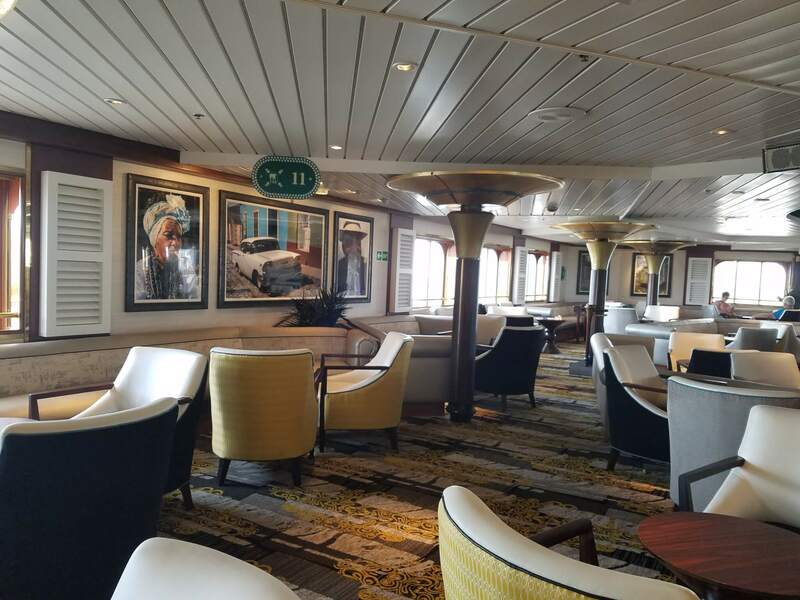 We tried most of the restaurants on our 3 day cruise and found the standard of food to be a little better than I recalled from previous RCI cruises I had taken. Service by the very friendly staff was always excellent, the ipad ordering seemed to be everywhere and although it has its problems in these early days it did appear to be a popular and efficient method of keeping track of your orders. 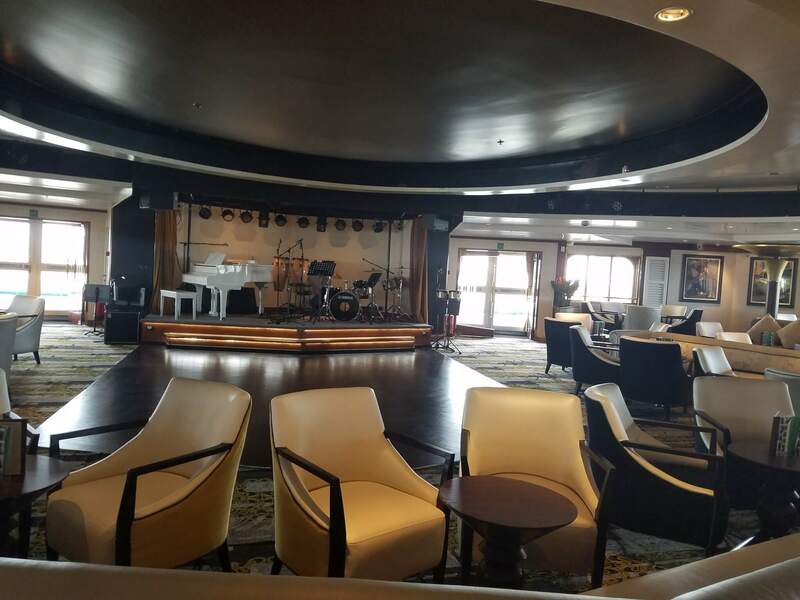 Briefly, the ship has so many entertainment options of so many different types it hard to know where to start. The most obvious and eye catching is perhaps on the upper deck where a gondola attached to a mechanical arm allows passengers to sail 300 feet above sea level and get a bird’s-eye view of the sea and ports. Cruisers can go skydiving at sea, crash into each other in bumper cars, fly on a trapeze at circus school or jog on a large track that skirts the legs of giant magenta polar bear sculptures as well as the more mundane sporting activities that abound. 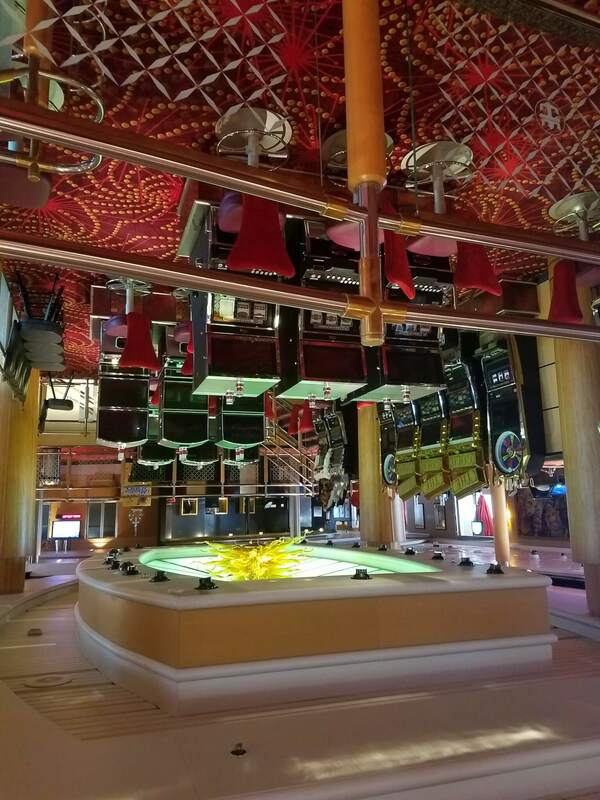 The two main venues being Two70, a completely interactive entertainment venue, is hands-down the most technologically advanced space of its kind at sea. 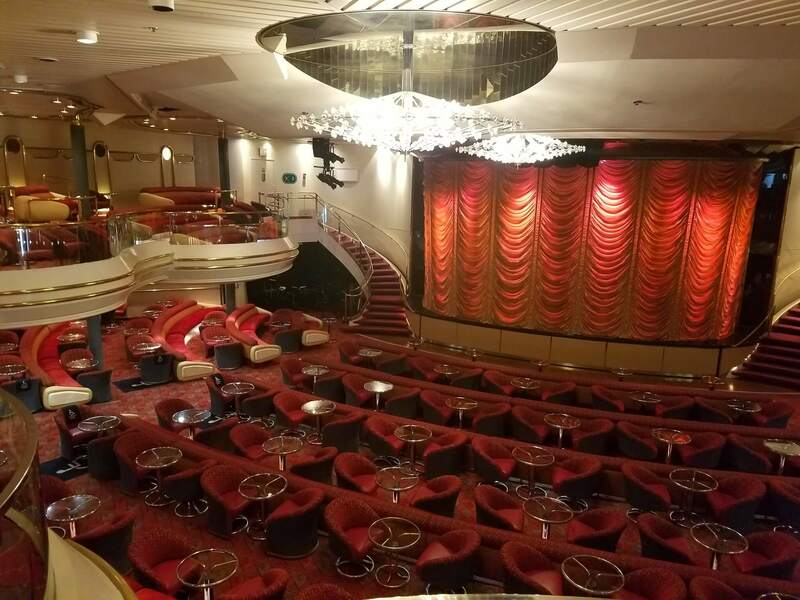 We caught a most spectacular show here that was a mix of high tech and Cirque de Sole, the other being the Show Lounge, a really well designed theatre where we caught a production of Moma Mia, as good a any I have seen in theatres ashore. 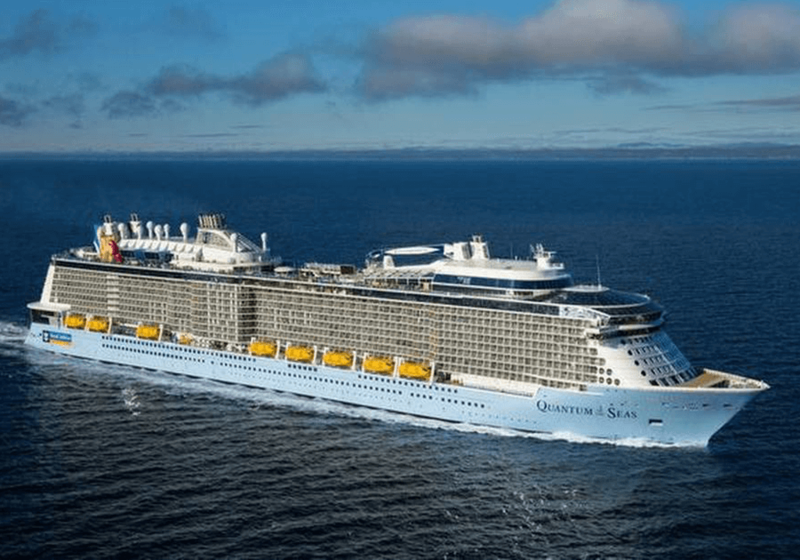 It’s not just the multitude of new concepts that make Quantum of the Seas an amazing ship. 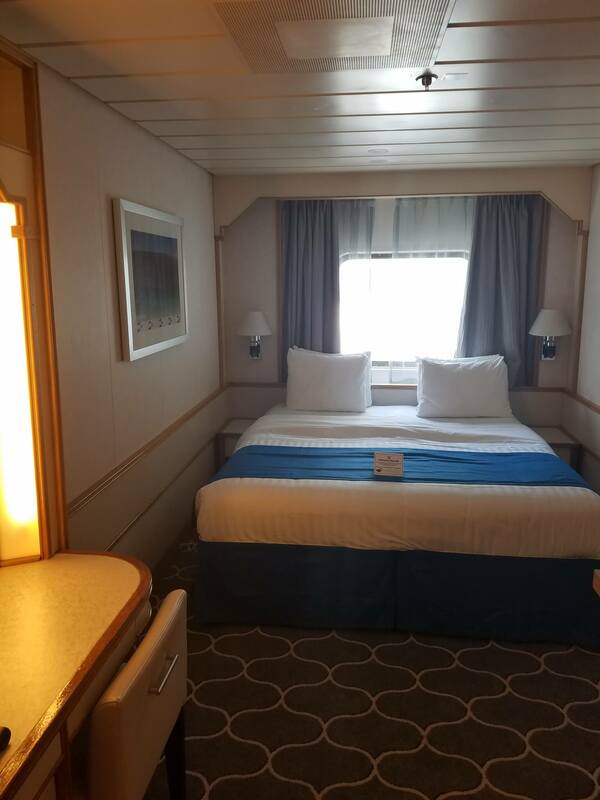 RCI really thought about the small touches and it’s most evident in cabins, where things like environmentally efficient lighting, bathroom night lights and bedside outlets are standard. Cabins and balconies are sizable by industry standards, and there’s more storage than most people could fill during any weeklong sailing. Bathrooms are small but smartly designed, and small features like in-shower hooks, shaving bars, and shower and vanity shelves and hooks make really efficient and comfortable use of the space. 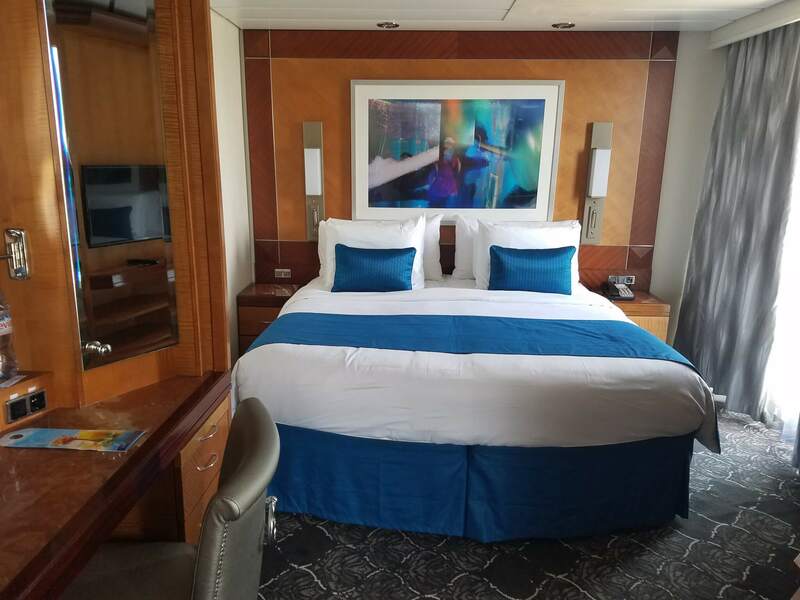 The Quantum carries a lot of passengers, she has 2102 stateroom in 34 categories and can carry a maximum of 4180 passengers. For the immediate future Quatum will cruise to the Bahamas and the Eastern & Western Caribbean from Port Bayonne, NY. She will eventually homeport out of China. As mentioned earlier, the weather was dreadful for the duration of the cruise, not that you would have noticed because there was just so much to do on-board anyway and the sheer size of the ship kept her amazingly stable the whole time and even though we had fairly strong winds on the beam most of the time you would never have known, even the wine in my glass barely moved! This report was prepared by James Castle. The views expressed as solely those of the author and not necessarily those of WWTCA.